The contrast between the two World Cup semi-finals could not have been greater. After Brazil collapsed under pressure, their defence falling apart in a remarkable 7-1 loss to a sparkling Germany, the Netherlands and Argentina cancelled each other out in a tactical encounter that the South Americans won but only after penalties. 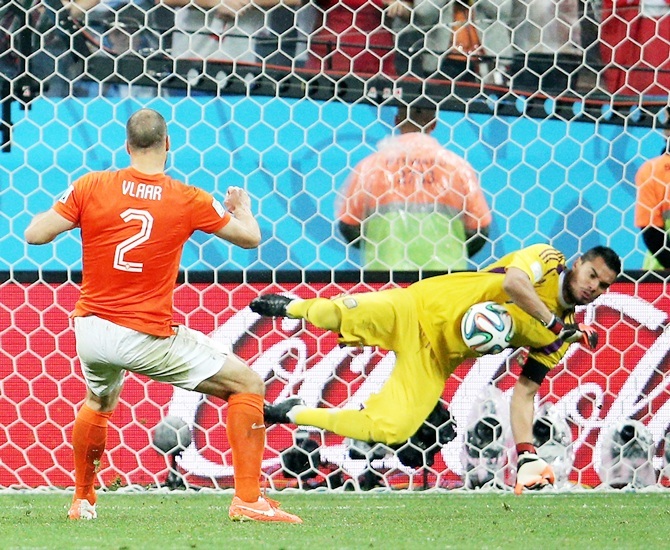 The match will go down in the record books as the first World Cup semi-final to finish goalless after extra time. Mistakes, bad defending and clinical finishing clearly make for great entertainment while organisation, discipline and well-executed containing tactics are less appreciated by the neutral. But while the qualities on display at the Corinthians arena did not thrill, they were qualities nonetheless with some outstanding defensive work from both sides. Javier Mascherano in the centre of midfield and Pablo Zabaleta at right back were excellent for Argentina, while Ron Vlaar, who will be remembered for missing the first penalty for the Dutch, was a rock at the back. It was a pity, however, that both teams were missing the same ingredient – a creative midfielder who could open up the game. Players who can control the tempo and also deliver the killer ball from midfield are hard to find in the modern game – the playmaker, the old 'number 10' is a rare breed and one whose absence is felt most in tight games like this. The match had been billed as a clash between Argentina’s Lionel Messi and Dutch winger Arjen Robben and it was clear from the outset that both managers were determined to make sure their team were not going to be punished by such an obvious threat. Every time Messi received the ball he was quickly closed down by one or more Dutchmen – with Nigel De Jong taking on the bulk of that responsibility until he was replaced in the 62nd minute by Jordy Clasie. 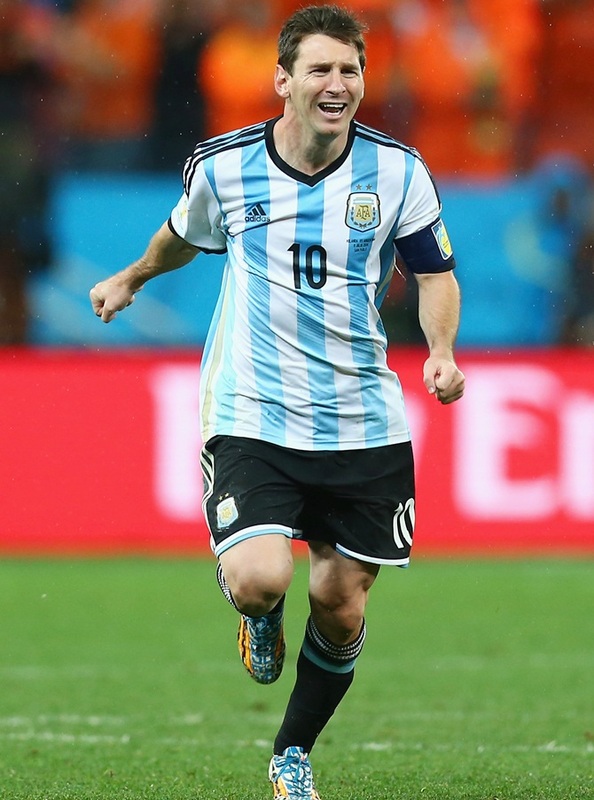 Not for the first time in the tournament, Messi drifted deeper and deeper in search of space but it was clear that Netherlands coach Luis van Gaal was prepared for that and with De Jong, rather than a defender, shadowing the Argentine there was no question of space opening up at the back. The absence of pacy winger Angel Di Maria was always going to be a loss for the Argentines but Enzo Perez did well as his replacement, providing moments of spark down the flanks. For the Dutch, Wesley Sneijder offered another reminder that while his club career may not have gone according to plan he remains an effective and industrious presence in midfield. Robben received the same treatment as Messi, being tracked diligently even when he switched wings or drifted into the centre, Argentina coach Alejandro Sabella having clearly worked out an efficient rotation of duties for dealing with the speedy winger. 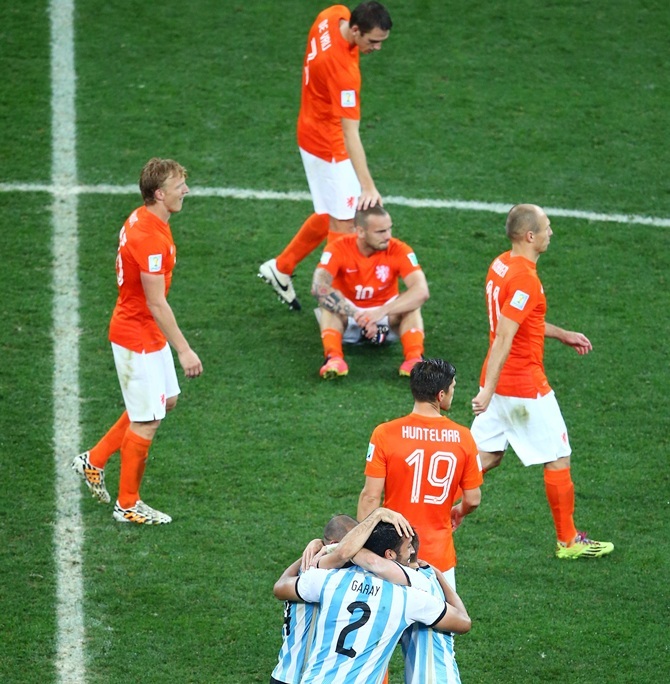 The game lost its way after the break with neither side willing to take the risk of committing extra men forward, but even when Robben did break clear and threaten with one of his characteristic bursts into the area, Mascherano found the pace and the leg extension to deliver one of the tackles of the tournament. Penalty shootouts are always tough for the loser to take but, on the evidence of this semi-final and the knockout stage of the tournament, Argentina have more in their armoury to test favourites Germany in Sunday's final. While they did not shine in Sao Paulo, Argentina forwards Gonzalo Higuain and Sergio Aguero will worry Germany more than Robin van Persie, who was largely uninvolved and again looked below his best having had a stomach upset ahead of the match. Van Gaal, who now heads to England take up his post as the new manager of Manchester United, squeezed as much as he could out of a modest Netherlands squad but it is Sabella who has the chance to go for glory at the Maracana. Stage set, now can Messi secure his place among the greats?